of a really old can of Ritz Root Beer, showing that these guys have either been around a long time or have just very recently upgraded their packaging. It is distributed by Beverage Corporation International out of Miami, FL, and really that's about all the info i have on this one. Sorry... it's just that generic. Again, i had the option to get this in a 12 pack of cans, but i elected to go with the 3 liter bottle since it was the cheaper option. The label has all the elements of the generic theme to it. It's brown, there is a mug of root beer, and it's fairly plain and straight forward. I don't hate it and it's definitely not the worst label i have seen, but it's not very inspiring either. I kinda had to search to find this one. It didn't just jump out at me like a good label will. But ultimately, i'm not going to hold this one up to high standards. It's simply not top tier stuff. I wish there was a way to explain the taste besides saying "meh". It doesn't make me want to stab a hobo or smash a kitten, but i can't say it gives me any bad feelings either. Wait... i think that came out wrong. But you get the idea. This stuff is very bland and middle of the road for a root beer. It's sweetened with high fructose corn syrup and leaves a bad aftertaste in your mouth, it's very well carbonated, and it tastes like root beer. Everything about it is just kind of blah. I don't like the aftertaste, but it's nothing i'm unfamiliar with as it is a common side effect of sub par root beers. Other than that, i don't really care one way or the other about it. 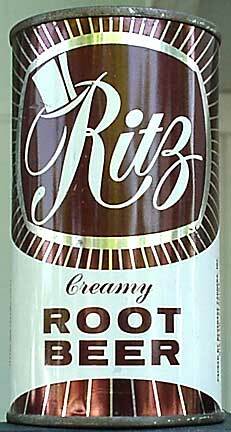 My official review is that Ritz Root Beer gets 4 (four) IBCs. It's a very standard generic recipe that can be found by picking up one of many other generic brands. Ultimately i don't care for it and won't be making a trip back to Bravo solely to buy more of this stuff. Now a refreshing glass of ham soda, well... that's another story.